Gear pumps: Diesel engine and gearbox lubrication systems are normally supplied by gear pumps which are independently driven for large slow speed engines and stand-by duties but usually shaft driven for medium and high speed engines. Gear pumps are also used for fuel and oil transfer, boiler combustion systems and other duties. The simple gear pump (Figure above) has rotors and shafts which are integrally forged of nitralloy steel. They are hardened all over and ground finished after hardening. Close grained grey cast iron is used for the casing and bearing housings. The shafts of the pump shown are supported in white metal bearings but needle roller bearings are an alternative. Lubrication is provided by the oil passing through. 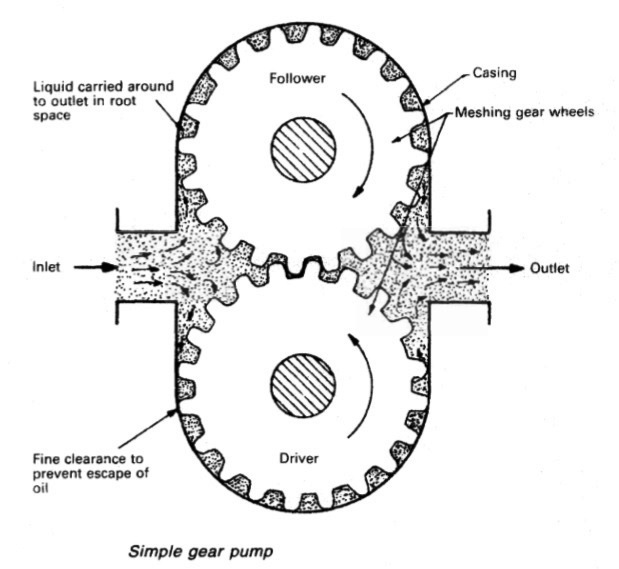 The liquid being pumped, is forced out after being carried around between gear teeth and housing, as the teeth mesh together. It is certain that the centrifugal effect contributes to the pumping action. There is no side thrust with straight gear teeth. Side thrust produced by single helical gears, causes severe wear and in one pump opened for examination, bronze bearing bushes exhibited wear to a depth of 3mm so that gears had become displaced axially. Despite the excessive clearance due to wear, it was noted that the purnp continued to be effective when repaired as far as possible (no spares being available). To gain the benefit of using helical gears, a double helical is necessary. This larger purnp is of the type used for large, slow speed engine lubrication systems. Spring loaded relief valves are usually fitted and may be of the adjustable calibrated type to facilitate the setting of delivery pressure.